Neda Ghofraniha is currently researcher at Istituto dei Sistemi Complessi-Consiglio Nazionale delle Ricerche in Rome, working in the field of random photonics. In the last five years, she was interested in the study and realization of innovative laser sources based on novel materials. Previously, she worked in the fields of nonlinear optics and soft matter. In February 2007, she had got the PhD in Physics, at the Department of Physics, University of Rome La Sapienza, with a thesis on “Nonlinear Optical Properties of Out of Equilibrium Soft Matter”. 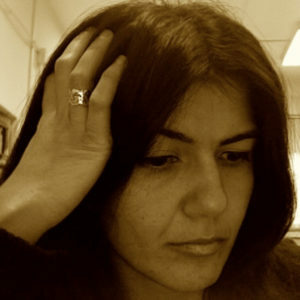 Neda is co-author of 24 international peer-reviewed publications, among which 1 Nature Comm., 4 Phys. Rev. Lett., 1 Laser and Photon. Rev., 1 Sci. Rep., 1 Soft Matter with Front Cover. She has an H-factor=15 (Google Scholar). She is author of a book chapter. She collaborated with many different groups in Europe. She participated to 23 conferences and workshops with 10 oral contributions and 9 poster presentations and was invited to 4 invited seminars in different European countries.